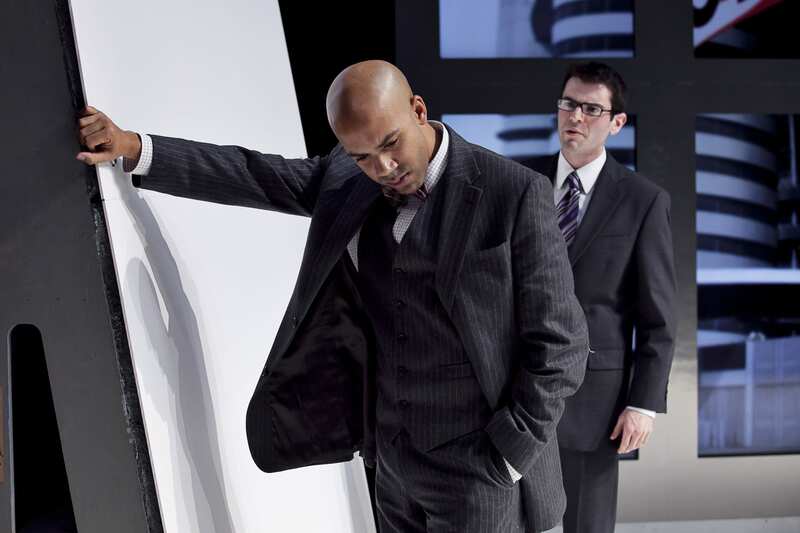 William Sturdivant and Sid Solomon in Julius Caesar. Photo by Heidi Boehnenkamp, courtesy Guthrie Theater. I knew we were in trouble with the new Acting Company/Guthrie Theater staging of Shakespeare’s Julius Caesar, brought into the present day via costumes and set design, when one of Caesar’s advisors walked onstage and the two exchanged one of those shake-it/grasp-it/pound-it handshakes typically encountered in made-for-TV movies about urban youth and in your uncle’s living room when he tries to show you how hip he is. By the time we got to the occupy rome sign and the Faireyesque Caesar posters, I was watching through my fingers with my hands over my face. As the Guthrie’s own Burial at Thebes demonstrated, you don’t need to conk people over the head with an iPhone to suggest parallels between ancient stories and current events: a well-told tale will bring any number of parallels to mind if the characters are believable and compelling. Director Rob Melrose has powerful talent at his disposal, and his Caesar has some great moments, but the unremitting awkwardness of this up-to-so-last-year staging drags the show down. In this Caesar, Julius and his inner circle are dressed in crisp business suits, Bjorn DuPaty cutting an unmistakably Obama-like figure as the eponymous ruler. The Roman citizens, for their part, are clothed in garb that bespeaketh semi-permanent residency in Zuccotti Park. The centerpiece of Neil Patel’s relatively spare set is a bank of flatscreens that works well to convey shifting settings, but is unfortunately also used for animations that manage to be both overstylized and overliteral, accompanied between scenes by the kind of music samples you hear on NPR after segments on controversial graffiti artists. (Video design is by Shawn Sagady, with sound design by Cliff Caruthers.) Battles, when they come, are enacted in low-lit slow motion a la Guy Ritchie. By the time Brutus and Cassius are running around in riot gear, the show starts to feel like a Max Fischer production. In the midst of all this, the cast labor to achieve some measure of versimilitude, and sometimes their labors pay off. Mark Antony’s big speech is the scene you can’t afford to screw up in this play, and the well-cast Zachary Fine pulls it off superbly, stepping down from his podium (and, thank Jupiter, the canned applause) to roll up his shirt sleeves and rally the rabble without so much as a shout of “Mic check!” William Sturdivant is also good as Brutus, especially when he’s pissed off at Sid Solomon’s smarmy Cassius, who you just know is a Windows guy. DuPaty plays Caesar with the kind of shameless charm that Obama himself might do well to turn on more often; adding a more generous dash of the President’s sincerity might have made Caesar’s demise feel more tragic, but when you’re getting stabbed in slow motion, you’re really fighting an uphill battle to keep the audience’s faces straight. I’m no Shakespeare purist—I loved Joe Dowling’s effervescently doo-wopping Two Gentlemen of Verona—but this digitally-enhanced Caesar feels less like a reboot than a system crash. Coverage of issues and events affecting Central Corridor communities is funded in part by a grant from the Central Corridor Collaborative. website; this webpage contains awesome and in fact good stuff designed for readers.